Prototype: Steel construction lattice mast with a wide cross support and 4 double hanging insulators. 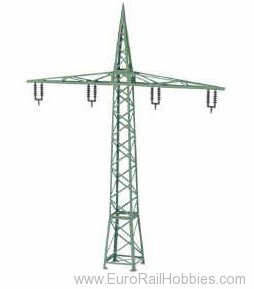 Model: The mast is a lattice design unit constructed of metal. The insulators are made of plastic with holes (0.8 mm / 1/16") for wire strands or nylon wire or thread as a power line. Height 266 mm / 10-1/2", width 206 mm / 8-1/8", base 35 x 35 mm / 1-3/8" x 1-3/8".